Brewing beer is all about working with sugars — glucose (dextrose), fructose, sucrose, maltose, verbose and all the rest. If you are like me, you want someone to cut to the chase and explain what’s what without referring to the fact that fructose differs from glucose by having a ketone rather than an aldehyde carbonyl group. You probably want answers to questions like: What is corn sugar? What is cane sugar? What is beet sugar? Can I prime my beer with table sugar? Honey? Maple Syrup? These are the sort of questions I intend to answer. But before I can answer the questions above, I do need to lay some groundwork and describe the different building blocks. It won’t take long and once you understand what everything is made of, it becomes a lot easier to understand the answers. All sugars are carbohydrates, molecules that contain both carbon (carbo-) and hydrogen (-hydrate) atoms. Carbohydrates have the general formula of CnH2nOn, meaning they have one carbon (C) and one oxygen (O) to every two hydrogens (H2). In sugars, the “n” usually equals 5 or 6. For example, glucose has the formula C6H12O6, meaning it is constructed of six carbon atoms, twelve hydrogen atoms and six oxygen atoms. Incidentally, fructose also has the formula C6H12O6, but the atoms are arranged differently in the molecule. The most common type of sugar is called glucose (aka. dextrose, blood sugar, corn sugar). Glucose is a monosaccharide, hexose-type sugar, meaning that it is a single molecule consisting of six carbon atoms. Other hexoses relevant to brewing are fructose and galactose. Elementally, these monosaccharides are all the same, but they are isomers of each other i.e., their chemical structure and arrangement gives them different properties. For instance, an isomer of glucose called fructose (also known as fruit sugar), tastes sweeter than glucose. Let’s examine the sugars found in a typical beer wort made from 2-row barley base malt. The main constituent of wort is maltose, which typically comprises around 50% of the total carbohydrates in wort. This is followed by maltotriose, which comprises around 18% of the total carbohydrates. The remainder of the wort is made up of glucose (10%), sucrose (8%), fructose (2%) and finally assorted dextrins, which together account for 12% of the wort carbohydrates. Maltose is a glucose disaccharide, which means that it is made up of two glucose molecules. Sucrose is another disaccharide and consists of one glucose and one fructose. Sucrose is a naturally occurring plant sugar, and is used as table sugar worldwide. Sources include sugar cane, beets, maple sap and nectar. Maltotriose is a trisaccharide consisting of three glucose molecules. Dextrins (aka. oligosaccharides) are larger carbohydrates consisting of more than three monosaccharide groups. Monosaccharides are sweeter tasting than polysaccharides. In descending order of sweetness: fructose is sweeter than sucrose, which is sweeter than glucose, which is sweeter than maltose, which is sweeter than maltotriose. Yeast are apparently very methodical little organisms. Even though sucrose usually comprises only a small percentage of the wort, studies have shown that most brewers yeast strains seem to work on it first — breaking it down into its glucose and fructose components. Once the sucrose has been broken down, the yeast cells consume the glucose first, followed by fructose, maltose and finally maltotriose. Some yeast strains behave differently; consuming maltose at the same time as the monosaccharides, but this seems to be the exception. Most yeast strains are glucophilic, utilizing most of the glucose in the wort before consuming the other monosaccharides. They also ferment most of the monosaccharides before fermenting maltose and subsequently maltotriose. In fact, it is known that high levels of glucose and fructose in a wort (e.g. >15–20%) will inhibit the fermentation of maltose. This repressive behavior is probably a common cause of stuck fermentations in worts containing a lot of refined sugars — the yeast have fermented the monosaccharides and then quit, leaving more than half of the total sugars unfermented. Yeast metabolize the different wort sugars in different ways. To consume the disaccharide sucrose, the yeast utilizes an enzyme called invertase, which works outside the cell to hydrolyze the molecule into its components — glucose and fructose. The glucose and fructose molecules are then transported through the cell wall and metabolized inside the cell. Conversely, maltose and maltotriose are transported into the cell first, and then are broken down into glucoses by the enzyme maltase. Even though the enzyme for both sugars is the same, maltose is typically consumed first, indicating that the cell wall transport mechanism for the two sugars is different. Maybe maltotriose is too big to get through the maltose door! The take-home message is that all fermentable sugars are broken down into monosaccharides like glucose before being utilized by the yeast, and that yeast evidently prefer to eat their sugars one course at a time. This has big implications for wort formulation in our pursuit of new recipes and unique styles. a.) To raise the alcohol level without increasing the body of the beer. b.) To lighten the body of the beer while maintaining the alcohol level. c.) To add some interesting flavors. d.) To prime the beer for carbonation. Reasons “a” and “b” are two sides of the same coin of course, but they do illustrate two different styles of refined-sugar adjunct beer. Belgian Strong Golden Ale has an OG of 1.065–1.080 and uses Belgian candi sugar to achieve a brilliantly clear, high alcohol, yet light-bodied beer. American Light Lager recipes have an OG of 1.035–1.050, and use corn sugar, cane sugar, or rice syrup solids to obtain a very light-bodied beer of average alcohol content that is perfect for a day with the lawnmower. Most American brewers use corn or rice in the mash. Those that do use syrups usually use corn syrups that have a carbohydrate spectrum very similar to all-malt wort. Simple sugars are typically used for low-carb beers. Various sugars have various flavors. The monosaccharides do not have a definable flavor other than sweet. But other natural sugars like honey and maple syrup, and processed sugars like molasses have characteristic flavors that can make a nice accent for a beer. This is what homebrewing is all about, really — taking a standard beer style and dressing it up for your own tastes. You can make a maple syrup porter, or a honey raspberry wheat, or an imperial Russian stout with hints of rum and treacle. The possibilities are myriad. On the other hand, I have coined a phrase that will serve you well in your experimentation, “The better part of flavor is discretion.” A beer with 20% molasses is going to taste like fermented molasses, not beer. And lastly, priming — the addition of 2-3 gravity points of fermentable sugar per gallon to carbonate the batch. Most folks did their brewing at the boiling stage, they don’t want to change their flavor profile at this stage, they simply want an unobtrusive sugar to carbonate the beer. Other brewers actually look at this last stage of fermentation with an ulterior motive; they want to add character with this final step. Whatever your goal, you can select one of several sugars to accomplish it. The most common example of a simple brewing sugar is the corn sugar that is commonly used for priming. Corn sugar is about 95% solids with 5% moisture. The solids are about 99% glucose. Corn sugar is highly refined and does not contain any corn character. Brewers seeking a corn-like character, for example in a classic American Pilsner, need to cook and mash corn grits as part of an all-grain recipe. Rice syrup solids are another glucose product, and there are different types. For example, one high glucose type is about 75% fermentable sugars (50% glucose, 25% maltose), 20% other carbohydrates (dextrins), and 5% moisture. A high maltose type could contain only 5% glucose, 45% maltose, 45% other carbohydrates and the same 5% moisture. Extract brewers seeking to brew a Budweiser clone can use rice syrup solids to obtain a similar character to the real thing. Pure sucrose is the reference standard for all fermentable sugars because it contributes 100% of its weight as fermentable extract. It does not contain the 5% moisture as glucose does. One pound of sucrose dissolved in enough water to make one gallon (3.8 L) yields a solution with a specific gravity of 1.046. 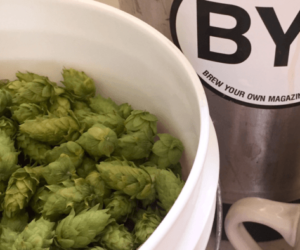 In the homebrewing lingo, it has an extract yield of 46 points per point per gallon (or 46 point gallons per pound, to use better terminology for the units). Lots of different brewing products are made from sucrose or the semi-refined byproducts of sucrose. Both sugar cane and sugar beets are used to make table sugar and the refined products are indistinguishable from one another. However, you do not get useful brewing byproducts from beets, only sugar cane. Molasses is a common byproduct and is used to make brown sugar as well. The fermentation of molasses produces rum-like notes and sweet flavors. Brown sugar, which only contains a small amount of molasses, will only contribute a light rummy flavor to beer. Belgian candi sugar is sucrose that has been caramelized to some degree, depending on the color. Dark candi sugar will have more of a caramel taste than the amber variety. Aside from the caramel notes, it will behave exactly like table sugar. Invert sugar syrups, such as Lyle’s Golden syrup, are made from sucrose that has been hydrolyzed to separate the glucose and fructose. This has two effects: first, it makes the sugar more syrupy and less likely to crystallize. Secondly, it makes it sweeter. Invert sugar syrup is like artificial honey without the characteristic honey flavors. Golden syrup type products tend to be a bit salty tasting due to the acid -base reactions during manufacture. Treacle is partially inverted molasses combined with other syrups. The flavor contributions from treacle can be strong, so it is best to use it in heavier bodied beers like English strong ales, porters, and sweet stout. One half cup per 5-gallon (19-L) batch is a recommended starting point. Maple sap typically contains about 2% sucrose. Maple syrup is standardized at a minimum of 66° Brix, and is typically 95% sucrose or more. Grade B syrup can contain 6% invert sugar, while Grade A Light Amber will contain less than 1%. You will get more maple flavor from the Grade B syrup. The characteristic maple flavors tend to be lost during primary fermentation, so adding the syrup after primary fermentation is over is recommended to retain as much flavor as possible. This practice will also help the beer to ferment more completely because it will not trigger the maltose inhibition discussed earlier. For a noticeable maple flavor, 1 gallon (3.8 L) of Grade B syrup is recommended per 5-gallon (19-L) batch of beer. The sugars in honey are 95% fermentable, typically consisting of 38% fructose, 30% glucose, 8% various disaccharides and 3% unfermentable dextrins. Honey contains wild yeasts and bacteria, but its low water content — usually around 18% — keeps these microorganisms dormant. Honey also contains amylase enzyme, which can break down larger sugars and starches into fermentable sugars like maltose and sucrose. For these reasons, honey should be pasteurized before adding it to the fermenter. The National Honey Board (www.nhb.org) recommends that honey be pasteurized for 30 minutes at 176 °F (80 °C), then cooled and diluted to the wort gravity. To retain the most honey flavor and ensure best fermentation performance, the honey should be added to the fermenter after primary fermentation. 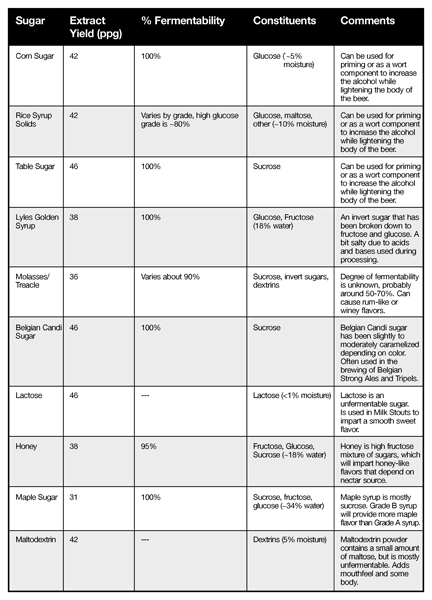 The National Honey Board recommends the following percentages (by weight of total fermentables) when brewing with honey: Add 3–10% honey for a subtle honey flavor in most light ales and lagers. Add 11–30% for a distinct honey flavor note to develop. Stronger hop flavors, caramelized or roasted malts, spices or other ingredients should be considered when formulating the recipe to balance the strong honey flavors at these levels. At levels of 30–66%, the flavor of honey will dominate the beer. These levels are associated with braggot, which is considered by the Beer Judge Certification Program Style Guidelines to have maximum honey to malt ratio of two to one. If your beer contains 66–100% it is considered to be a form of mead, according to the BJCP. The most commonly quoted answer to this question is 3/4 cup (~4 oz./113 g by weight) of corn sugar for a 5 gallon (19 L) batch. This will produce about 2.5 volumes of carbon dioxide in the beer, which is pretty typical of most American and European pale ales. Three ounces (by weight) will produce a little lower carbonation level of about 2.0 volumes, and five ounces will produce about 3.0 volumes. For more information on carbonation volumes, see Chapter 11 of my book, “How To Brew,” available online at www.howtobrew.com. The point is that 4 oz. (133 g) of glucose is typically used to carbonate five gallons, and this is the basis for calculating amounts of other priming sugars. For example, let’s calculate how much honey to use to equal 4 oz. (113 g) of corn sugar. Honey is about 18% water and is quoted as being 95% fermentable. If we solve for X we find that it equals 4.62 oz. (131 g) So, priming with 4.62 oz. (131 g) of honey should give carbonation equal to priming with 4 oz. (113 g) of corn sugar. Another way to approach this problem is by looking at sugars according to their extract yield — what the specific gravity of a solution will be if a pound of the sugar is added to water to make a gallon (3.8 L) of solution. The table on the facing page (p. 38) lists the extract yields of several common brewing sugars. The extract yield allows you to calculate the amount your original gravity will be boosted by adding this sugar. The fermentability — also given in the table — describes what percentage of the sugar can be utilized by your brewers yeast. Solving for X, we get 4.65 oz. (291 g) of honey. The calculation for other sucrose products are very straightforward because the sugars are usually 100% fermentable, except in the case of partially refined sugars like molasses where there is a lot of other material present other than sugar. Malt extract typically has a significant proportion of unfermentable sugars, varying from 60–85%, depending on brand and yeast strain. A typical fermentability for extract is probably about 75%. Brewing is all about utilizing sugars and those sugars always end up as monosaccharides when they are fermented. However, the yeast process each type of brewing sugar differently as it is being broken down into glucose and fructose, and these differences will effect our fermentation performance. Usually a high percentage of glucose and fructose in the wort will inhibit the fermentation of maltose and maltotriose, and this can lead to a stuck fermentation. Therefore, brewing adjuncts high in monosaccharides should be added after primary fermentation has finished. These sugars can be used for priming though, with allowances made for the percent moisture and degree of fermentability. Hopefully this article has provided a better understanding of how to use sugars in your brewing. One spice, two spice, red spice, blue spice. While mixing beer with spices offers an unlimited array of options, the approach to spicing beer can be handled in stride using a few key guidelines explained by Josh Weikert.